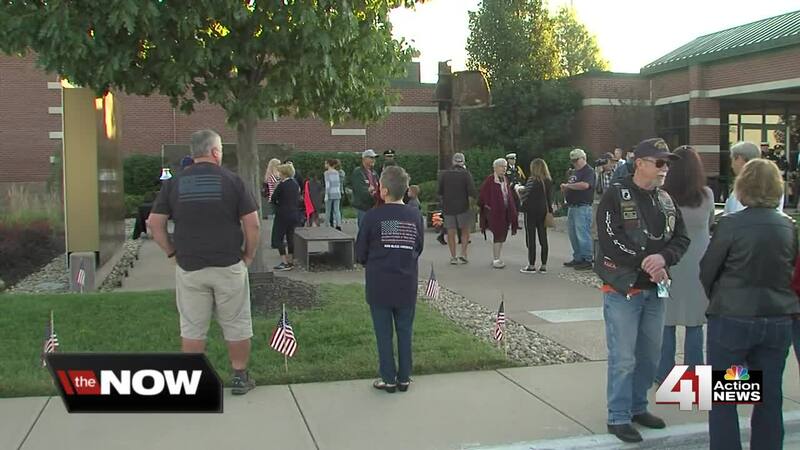 People visited the 9/11 Memorial in Overland Park Tuesday morning to remember the lives that were lost 17 years ago. 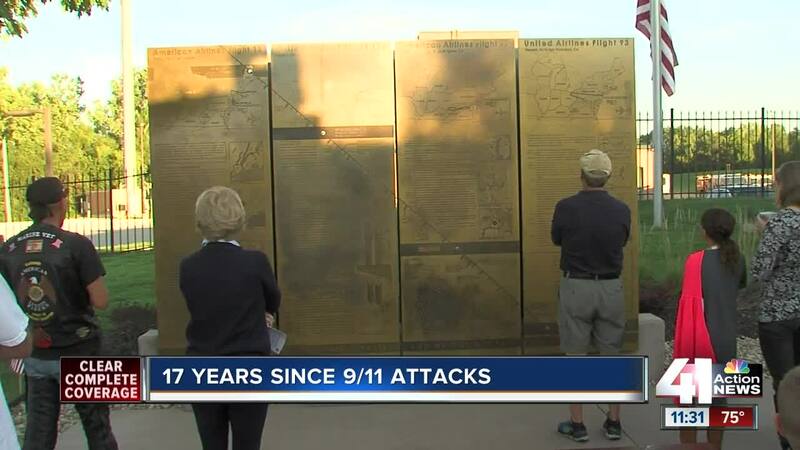 OVERLAND PARK, Kan. — Several 9/11 commemorations happened in the metro Tuesday. A memorial service was held at 7:30 a.m. at the Fire Training Center in Overland Park. At the service, there weren't any speeches, just remembrances of what happened 17 years ago. Several people visited the 9/11 Memorial, which lists the people who lost their lives that day and has a piece of steel that was from one of the fallen Twin Towers. Throughout the service, there were moments of silence. Visitors would step away from the memorial, and honor guards would place flowers on the memorial at specific times. The times signified when the planes hit the Twin Towers and the Pentagon. One mother shared this day with her two children. "I brought my boys here this morning just to honor the sacrifice of all the firefighters, police officers, EMS. All the people who died and all of our military, too, who continue to fight for our freedom," Heidi Hogan said. "We're so thankful for their sacrifice and their dedication." Jane Golden worked at the World Trade Center, and 17 years ago she was running late for work. "My neighbor and I commuted, and we opted to go in a little late instead of taking the 5:20 train, and she took the kids to school and then I was waiting," Golden said. "We were heading to the train station and then I got a call at home to turn the TV on, and I turned the TV on and I saw what was transpiring and I thought of all those people." She said this day never gets easier. "I would say the 10th is worse than the 11th because you know what's coming, and today is almost a picture perfect day of 9/11. The weather is very similar, and I think that everyone has to take time to remember," Golden said. "I think the one thing I try to tell my daughter, ‘You never know what's going to happen so you never go to bed angry.'" There will be spotlights at the memorial Tuesday evening that will be on all night. The two light beams will symbolize the Twin Towers.